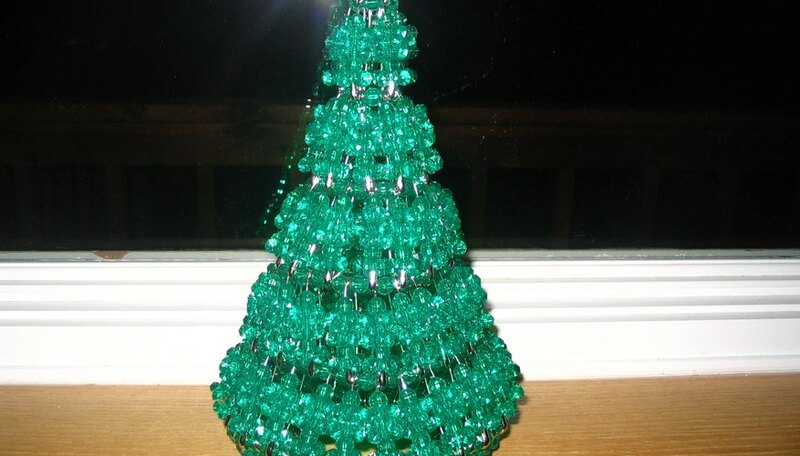 Make a beautiful, free-standing safety pin and bead Christmas tree to add to your holiday decor. You can put lights inside and watch them shimmer. When Christmas is over, you won't want to put them away. Fill all the safety pins with beads in the following order: one round bead; three starbursts; one round bead; and one starburst. Carefully close the safety pins. Put a piece of wire through the end of a pin, then add one bead and then a pin and another bead until five pins are strung. Bring the wire together and pull the pins and beads tight to make a small circle. Twist the wire, cut the ends and tuck the sharp point under to complete the first row. Place a piece of wire through the head of one pin from the first row, then string one beaded pin, one round bead and another beaded pin. Put the wire through the head of a pin from the first row and repeat the pattern until 10 new pins are used. Pull the wire tight, twist and cut the wire. Put a piece of wire through the head of a pin from second row and string one beaded pin, one round bead and one beaded pin. Put wire through head of the second row pin and string one round bead, one beaded pin and one round bead. Continue this pattern until 15 of the beaded pins are used. Pull the wire tight, twist and cut wire. Put a piece of wire through the head of a pin from row three, then string one beaded pin, one round bead and one beaded pin, then the head of a row-three pin, then string one round bead, one beaded pin and one round bead, then the head of the next pin, followed by one round bead, one beaded pin, one round bead and continue this pattern until you've strung 20 beaded pins. Pull the wire tight, twist and cut. Put a piece of wire through the head of a pin from the fourth row and string one beaded pin, one round bead, one beaded pin, then through the head of the next pin and string one round bead, one beaded pin and one round bead. Next, run the wire through the head of the next pin and then one round bead, one beaded pin, one round bead. Run the wire through the head of another pin and string one round bead, one beaded pin, one round bead and repeat this pattern until 25 of the beaded pins are used. Pull the wire tight, twist and cut. Put a piece of wire through the head of pin from the fifth row and string one round bead, one beaded pin and one round bead and repeat this pattern until 25 beaded pins are used. Pull the wire tight, twist and cut. String the wire through the head of a pin from the sixth row and string one bead before placing the wire through the head of another pin from row six. Continue this pattern until every pin has a bead between it. Pull the wire tight, twist and finish. Place a small string of lights inside the tree and plug them in.